As recently as yesterday, Child of Eden was the best reason to own a Kinect for your Xbox 360. It’s still out there and still worth every penny, but the “best reason” award has officially changed hands. Twisted Pixel’s The Gunstringer is here, and it is very, very awesome. 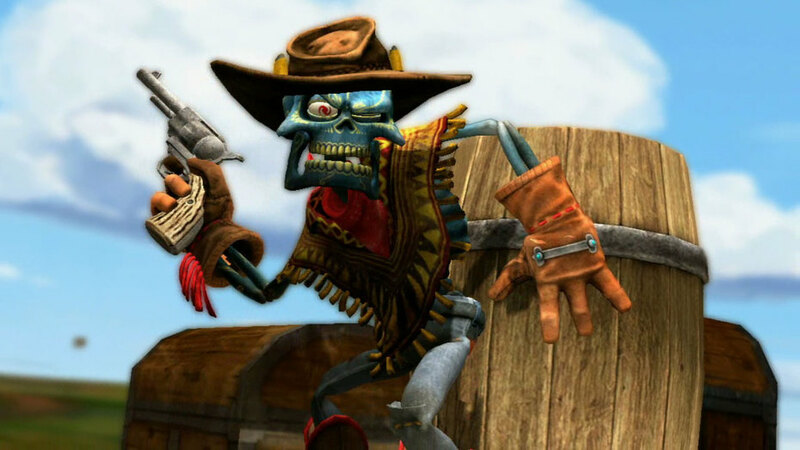 The Gunstringer puts you in control of the titular cowboy, an animate skeleton armed with a six-shooter and a strong desire to do right in the world. You’re not actually playing as the character, but rather the puppeteer controlling him. See, the Gunstringer is a marionette, and it’s up to you to guide him through a series of plays in which he takes on a variety of low-budget baddies, from cardboard cowboy cutouts to horses with exploding beer cans for bodies. A narrator comments on your progress through the game’s paper-and-cardboard environments while the action occasionally cuts away to response shots from a live-action audience. It’s delightfully bizarre in all the right ways. Of course, the presentation wouldn’t count for much if the gameplay didn’t deliver, but fortunately that’s not an issue here. Each level is on rails, with the basic controls built around using your left hand for left/right movements and jumping and your right hand acquiring targets and firing your weapon. The game uses lock-on targeting, so all you really need to do is pass your hand over up to six targets and then jerk your arm back to shoot, as if you’re firing a revolver. The action occasionally jumps to cover-based gunplay, with you leaning out to the left and right to take on enemies as they spawn all around you. At other times you’ll find yourself guiding our heroic skeleton through a 2.5D side-scrolling environment, at which point you simply have to worry about jumping your way past obstacles. Other control quirks pop up at different points, such as when Gunstringer gets on his trusty horse or during certain boss fights, but it’s all very intuitive and easy to pick up in the moment, so long as you remember the basic premise that you’re controlling a marionette. The story unfolds over the course of a series of multi-chapter plays, with revenge being the main theme. It’s a silly narrative overall, but also a completely charming one thanks to Twisted Pixel’s zany presentation. You can finish the entire core game in a matter of hours, though there’s a bonus store that offers additional modes you can purchase as well as bonus content like music and chapter-specific audio commentaries. There’s also the day one free DLC, “Wavy Tubeman Chronicles,” which serves as a sort of follow-up to the main game’s prologue. The DLC gets a special shout because of how it stands apart from the rest of the game (and because, as a free day one DLC release, it’s sort of part of the game already). 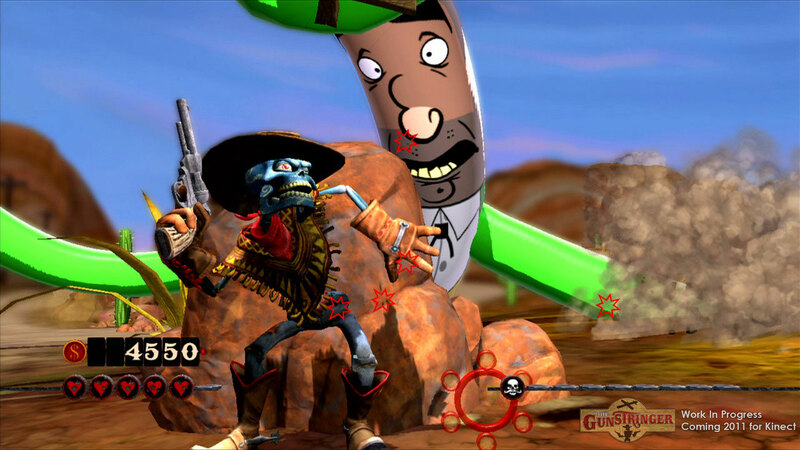 “The Wavy Tubeman Chronicles” is a live-action outing inspired by the arcade light gun classic, Mad Dog McCree. It’s exceedingly nuts, and actually manages to out-bizarre what is already a very unusual game. It’s also worth mentioning the game’s two-player co-op mode. You’ll still see just one Gunstringer on the screen when your second player arrives, but the screen will now be graced by two sets of crosshairs instead of one. In co-op mode, one player controls Gunstringer’s movements and six-shooter, just as in the solo mode. Your companion only has to worry about managing Gunstringer’s second weapon with the extra set of crosshairs. Performance in every chapter is ranked on a bronze/silver/gold medal scale, and having a second player along for the ride makes hitting those higher-level benchmarks considerably easier. That’s The Gunstringer. It doesn’t offer you hundreds of gaming hours as Skyrim does, nor will it thrill you with the sort of visceral action you get from popular first-person shooters like Call of Duty. The biggest drawing is the overwhelming strangeness of it all, and the fun that is to be had in starring in your own, personal marionette show. If you have a Kinect, get this game. Seriously. Just do it. You won’t regret it.